It was a fight that had a long history to it. On Sunday night-Monday morning at Aurus in the suburbs of Mumbai, Sanjay Dutt hosted a party to celebrate the success of his Kancha role and Agneepath. Guests were having a ball when at around 4.30 am Shah Rukh Khan entered the venue straight after the Filmfare awards with three bodyguards. According to eyewitnesses, he was apparently in an inebriated condition. Soon, he headed towards filmmaker Shirish Kunder and roughed him up. Says an eyewitness, "We didn't know what was happening. We saw SRK enter. Then we saw him head towards Shirish from behind the director. SRK pulled Shirish down to the ground by his long hair. We were all shocked. We had never seen SRK behave this way before. Before anyone could react, Baba Dewan, the owner of Aurus ran in and intervened. SRK told Dewan to keep out. Dewan said the place belonged to him and he must intervene. The fight would've been prolonged had Sanjay Dutt not pulled SRK away from the ugly scene." The shell-shocked Kunder apparently left immediately. We tried to probe the cause for Shah Rukh's provocation. Says a source close to Kunder, "Shah Rukh was smarting since Kunder made a sarcastic comment on SRK's Ra.One when it released. But the immediate provocation was apparently a comment that Kunder made about SRK and Priyanka Chopra at the party that SRK overheard. But that is hogwash. Kunder didn't say anything about Priyanka. Why would he? Everyone was there to celebrate a success, not to create ugliness. " Kunder and Shah Rukh have a history, of course. Kunder's wife Farah Khan was one of Shah Rukh's closest friends. They fell out a year back. 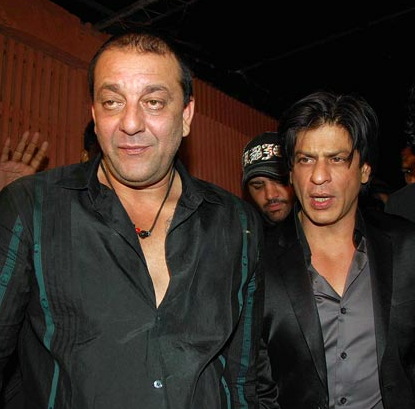 Kunder, we believe, faced the brunt of SRK's pent-up wrath at Dutt's party. Farah who was shooting all night for Bela Sehgal's Shirin Farhah Ki Nikal Padi got to know of the fight only when she returned home in the morning. Shocked and hurt Farah says, "Shah Rukh has always told me that physical abuse is the worst way to sort out a problem, and that it means the person who's hitting has either a personal or professional crisis going on. It saddens me to see him doing the same." A theory doing the rounds is that Sanjay Dutt too joined Shah Rukh to bash up Shirish Kunder. Rubbishing this rumour, Dutt clarified, "I didn't join in the fight. I sorted out the fight between Shah Rukh and Kunder."